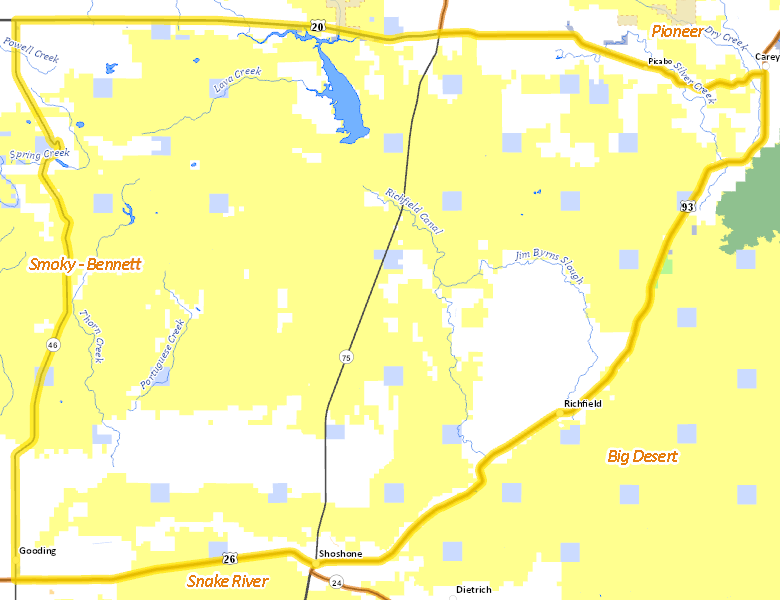 Those portions of BLAINE, CAMAS, GOODING, AND LINCOLN COUNTIES within the following boundary: beginning at Gooding, then north on State Highway 46 to U.S. 20, then east on U.S. 20 to Carey, then southwest on U.S. 93 to Shoshone, then west on U.S. 26 to Gooding, the point of beginning. The boundary of the Craters of the Moon National Monument was recently greatly enlarged by Presidential Proclamation. Approximately 410,512 acres of the expansion will be primarily managed by the National Park Service which has stated its intention to close this area to hunting. The State of Idaho strongly opposes this action and is working to keep this area open to hunting in accordance with the language in the Presidential Proclamation which assures continued jurisdiction over wildlife by the State of Idaho. At the time of this printing, the issue remains unresolved. It is the hunter’s responsibility to check the current status of open/closed area boundaries prior to hunting. No properties are currently available in Unit 52. No National Forest lands fall within Unit 52. There are no wilderness areas in Unit 52.